Theo F. Tone & Co.
Theo. F. Tone & Co. Bet. 124th & 125th Sts. 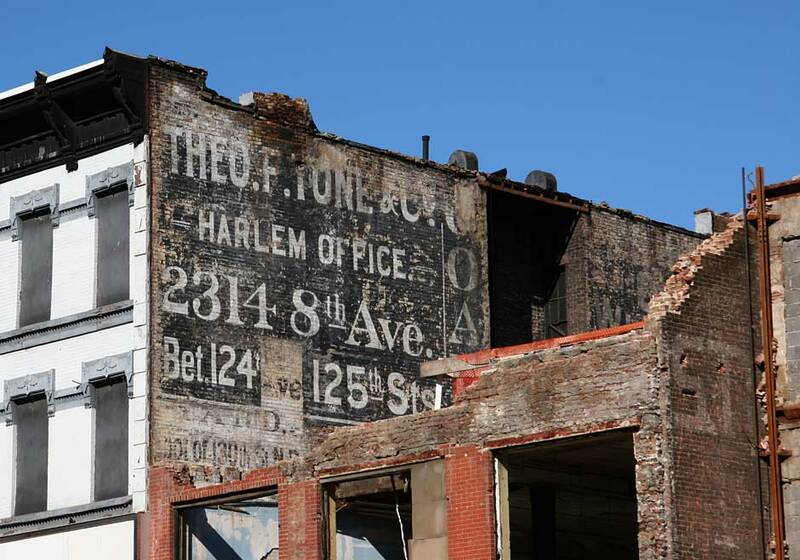 Demolition at the northwest corner of 125th St. and Frederick Douglass Boulevard (aka 8th Ave.) in late 2011 revealed this sign for Theo. F. Tone, coal dealer. 2314 8th Ave. would have been close to the southeast corner of this same intersection. Theodore F. Tone (1827?-1908), a native New Yorker, was listed in the 1859 New York City Business Directory as a retail grocer located at 130th St. and 12th Ave. During the Civil War years (1862-1866) he was taxed yearly as a retail liquor dealer at this same address. In 1865 in addition to $50 assessed for his business, Tone paid $1.00 each for possession of a carriage and a watch. In the 1860 U. S. Census Tone's occupation was recorded as "Coal & Wood." He was 34 years old and lived in New York's Ward 12, District 3, with his wife, Catherine, and their daughter, Mary, age 2. Their post office was Manhattanville. In the 1870 U. S. Census Tone's occupation was recorded as "Coal Yard." He was 45 years old and lived in New York's Ward 12, District 16, with his wife, Catherine, and their son, Fred, age 7. In the same year the non-population census schedules recorded Theo. F. Tone Coal Yard with a capital of $5000. The business employed an average of 6 laborers, paid annual wages of $3500, and sold an annual product of 22,000 tons of coal. In the 1870s Tone's coal yards were located along the North River (Hudson) at the foot of West 130th St. and at 155th St and 10th Ave. (Amsterdam Ave.). The office location at 2314 8th Ave. appears first in city directories in 1886. From the early 1880s until his death Tone lived near his 8th Ave. office, at 245 W. 126th St. between 7th Ave. and 8th. Ave. In 1881 the New York City Dept. of Docks leased North River piers at 130th and 131st St. to Theodore F. Tone. Three separate leases totaled an annual rent of $1575. On Theodore Tone's death in 1908 the following notice appeared in the New York Times (6 May 1908), "Theodore F. Tone, a retired coal dealer, died at his home, 245 West 126th Street, on Monday at the age of 81. He had been in the coal business for fifty years, and his firm, the Theodore F. Tone Coal Company, still has a business at North River and 134th Street." A second part of the Theo. F. Tone sign was painted towards the rear of the building on 125th St. (click for image). This seems to say, "... Tone / Coal / Wharf Pockets[?] / 133rd St. & 12th Ave. / Harlem Office / 2314 8th Ave. bet. 124th 125th." But what is the word after wharf? It looks like pockets, but does this mean anything? This ad for Theo. F. Tone & Co. appeared in the catalog of the Harlem Library, 1893. Its wording is similar to the rear sign, but here it reads, "Wharf and Elevators." The ad claims "Established 1850."